No matter what type of fundraising campaign your organization is running, a well-developed communications plan will help to ensure your success. A communications plan’s purpose is to help your organization think more strategically and communicate more effectively to meet your campaign goals. Map out every step of your campaign. Think through your message points. Email autoresponders — It’s important to include autoresponders in your communication’s plan. Even though these are automated messages sent when someone fills out a form or makes a donation, they should still be integrated into your overall strategy so that they remain cohesive with your other messages. For each message sent to each audience, you must determine how to send each message. The communications channels can include your organization’s own channels, such as email and direct mail outreach. They also should include external channels such as TV, newspaper, and social media. When you create a communications calendar, be sure to work closely with your marketing department to ensure your communications don’t overlap with other planned messaging. 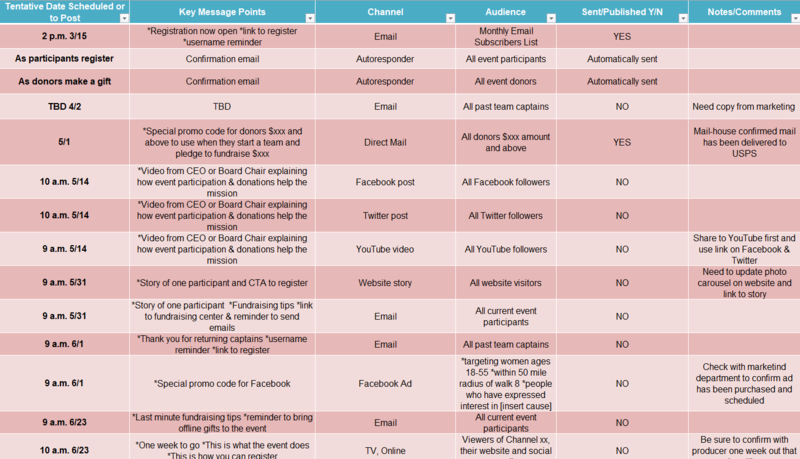 You also might be able to leverage other planned communications for your campaign. Once you know how you want to reach your audiences, the schedule for your communications from the time you announce your campaign through the campaign’s end is critical. Write down the date of the very last communication you’ll send for your campaign, and then work backward to add all of the other communications and prep work you’ll need to complete leading up to that last communication. If you want to secure any public service announcements or local media appearances, allow plenty of time to schedule. Often, this can take weeks or even months to arrange. Running any fundraising campaign can be challenging. But with a little bit of thought and advanced planning for your communications, you can ensure you send the right message to the right audience at the right time to elevate your campaign’s success.